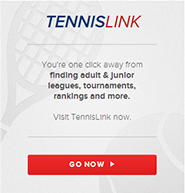 NEW...SUMMER SINGLES CHALLENGE LADDER FOR COLLEGE, HIGH SCHOOL AND MIDDLE SCHOOL PLAYERS! Please click on either the College or Junior menu option to the left for additional information and to register online. Registration is now open and will close on June 5. Ladder play begins on June 15!